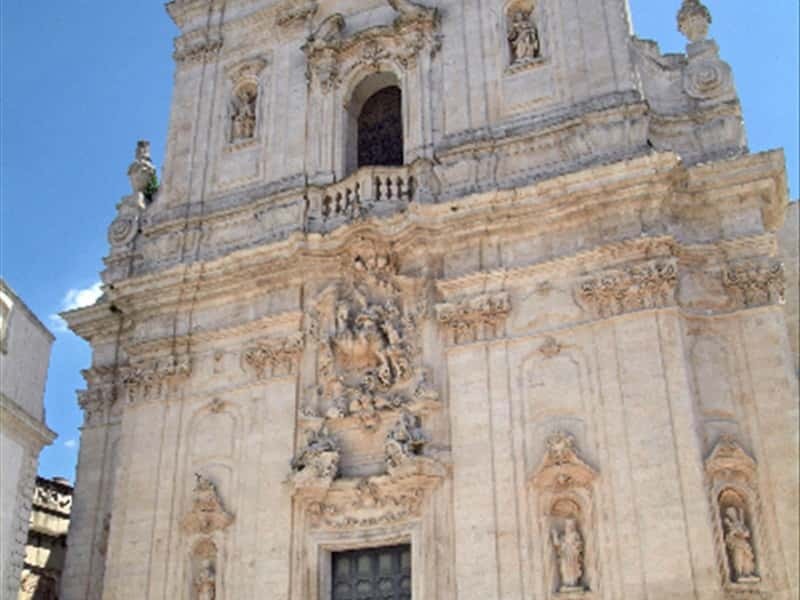 Martina Franca, a large town of about 50 000 inhabitants, is part of the province of Taranto. It rises at 431 m above sea level on the border of three provinces: Taranto, Brindisi and Bari and is the most important centre of Valle d'Itria, a charming place famous for its "trulli", the red colour land with dry stone walls. Martina's origins are not well documented, the most accepted theory is that it is founded by refugees of Taranto that deserted their lands after the continuous raids of the Saracens around the X century. Its name derives from San Martino, patron saint of the city, and the granted rights and franchises established in this area in order to encourage the population's growth, in 1300, by Philippe d'Anjou, Prince of Taranto. The area was therefore called "Franca" area. Martina is currently a town centre with a very dynamic economy and an important compartment is specialized in the production of clothes. The old centre is a jewel of Baroque Apulian style and the streets are narrow and full of corners. There are many mansions with superb wrought-iron balconies and the streets propose a sort of river bed so that rainwater does not overflow into the underground cellars at the sides. - in Pizza Plebiscito rises the most important church of the town, the Basilica of San Martino and nearby stands the Clock Tower. Just outside the walls of the centre lies the Church of San Francesco. Martina Franca differs to Alberobello for its trulli (casedde in local dialect), that here are built on the outskirts of the town, rather than within the walls. Finally, it is important to highlight that Martina is home, during the Summer months, continuously since 1975, of the "Festival della Valle d'Itria", a program of operas with famous international artists. This town web page has been visited 28,413 times.